A rich Black finish and traditional-styling make this Jewelry Armoire timeless and elegant. 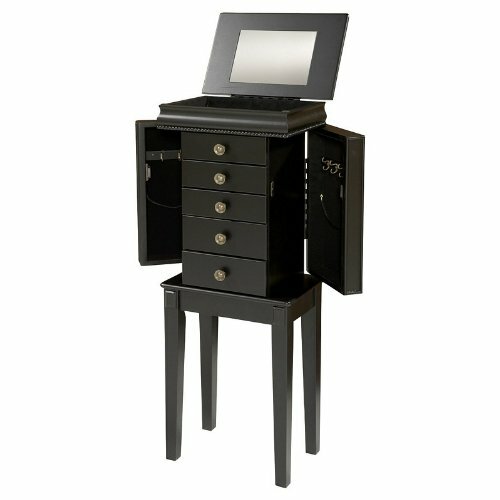 Featuring 5 drawers, a lift top lid with mirror opens to reveal a lined and divided compartment, complete with ring pads. Inside the 2 swing out doors there are 6 necklace hooks. Each door compartment is fully lined and topped off with a matching holdback to keep the necklaces in place when the doors are in motion. Top and leg assembly only. If you have any questions about this product by Linon Home Dcor, contact us by completing and submitting the form below. If you are looking for a specif part number, please include it with your message.